Xherdan Shaqiri admits Jurgen Klopp was left unhappy with Liverpool’s attacking efforts during Saturday’s 1-0 win over Huddersfield. The Reds were guilty of another disjointed display in the final third and were somewhat fortunate to leave the John Smith’s Stadium with all three points. Liverpool’s vastly-improved defence were again at hand to bail out their misfiring forwards and extend the club’s unbeaten start to the Premier League season. Mohamed Salah’s first-half winner proved the sole glimpse of some conviction in front of goal from Klopp’s men, evidently much to the frustration of the animated German. Discussing his manager’s fury, Shaqiri said: “He wants the best from you and always demands that you give 100 per cent,” per the Mirror. 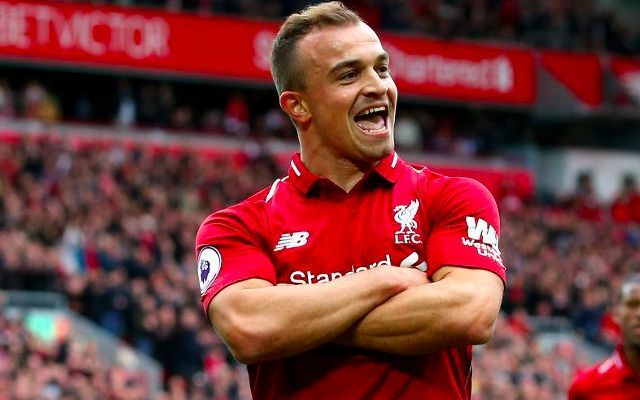 Saturday’s game marked just Shaqiri’s second league start for the Reds since his summer move from Stoke City, following on from his 45 minute appearance in last month’s 3-0 win over Southampton. The Swiss international was responsible for providing the assist to Salah’s goal and proceeded to serve as one of Liverpool’s brightest attacking sparks on the night. Many would argue he has also played his way into another start when Liverpool host Cardiff City at Anfield next Saturday. Goals may not be flowing as they previously have under Klopp, but the Reds continue to boast a place alongside Manchester City at the top of the table. You have to feel things will begin to click into place at some stage.